The new Text Analytics landing page comes with a specialized wizard that allows you to create and train text analysis models. The introduction of machine learning techniques to Decision Management improves structuring and modeling of text-based content for analysis, research, and investigation. Additionally, the existing Free Text Model rule form has been enhanced to accommodate text analysis models and a wide range of new options designed to provide you with more control over your analysis process. You can use this landing page to create text analysis models using a specialized wizard. Training and creating text analysis models allows you to introduce the machine learning-based approach to your text analysis process. Specify the analysis type and language. Select various machine learning algorithms that the model uses and check their accuracy. Upload a file that contains the data that the system uses to train the model. Train the model and review the detailed results of the model accuracy analysis. Export the .JAR file that contains the model. 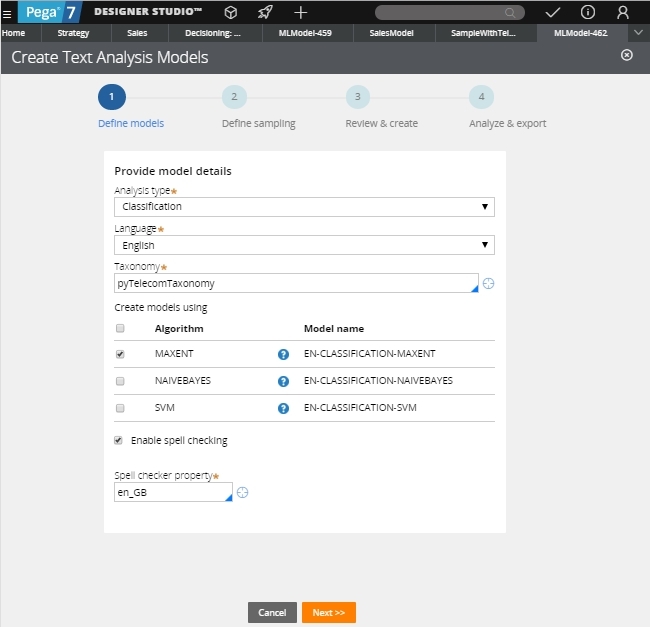 Create a text analysis model binary rule file and upload it as part of the decision data in the Pega 7 Platform. 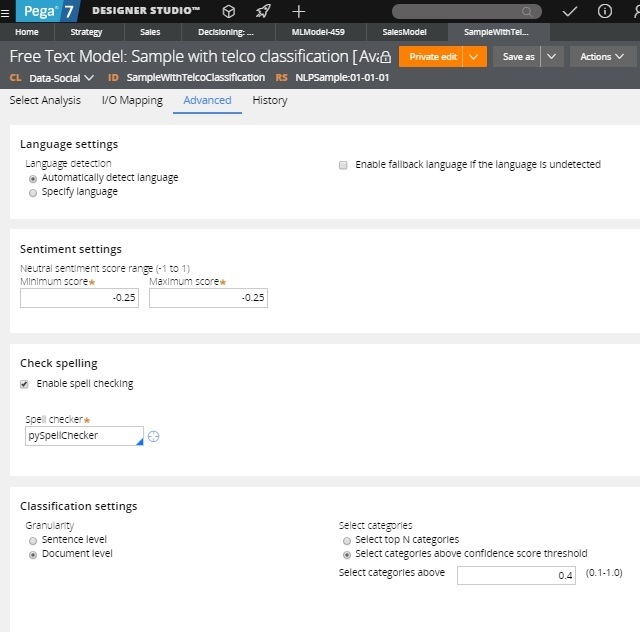 As part of the enhancements to the Free Text Model rule form, you can include a text analysis model in the sentiment or the classification analysis. This option allows you to combine the model-based and rule-based methods of text analysis and receive more reliable and accurate results. Additionally, the Free Text Model rule now has a new Advanced tab. Language settings - These settings allow you to automatically detect the language of the analyzed corpus, enable the fallback language if the system does not detect any language, and set the system to always identify the corpus as written in the language of your choice. Sentiment settings - These settings allow you to configure the score range of the neutral sentiment to suit your business requirements. Check spelling - The settings allow you to enable the spell checking option to eliminate spelling mistakes in the analyzed corpus. Without spelling mistakes, the system can assign the analyzed text to a given category more accurately and with a higher confidence score. Classification settings - These settings allow you to configure the granularity of the classification analysis and limit the number of categories displayed to those with the highest confidence score or those with the confidence score that is above a certain threshold. 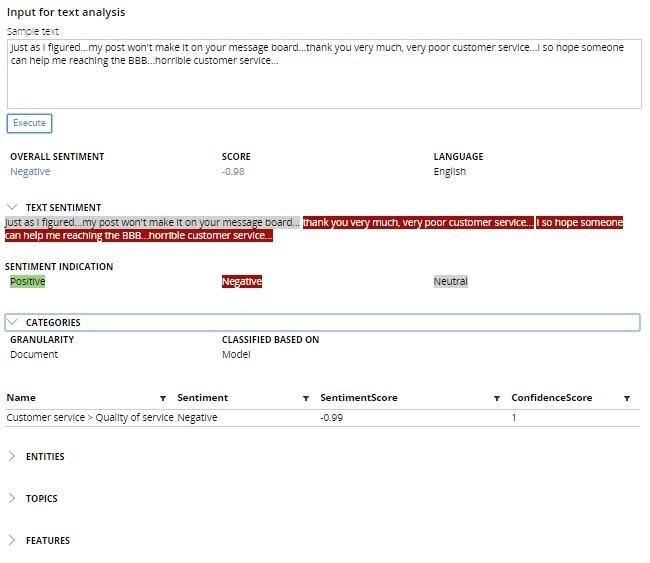 The Natural Language Processing (NLP) outcome mapping user experience improvements allow you to better navigate to the exact entity or category occurrence and highlight overlapping sentiments. For the classification analysis, you can examine various elements (categories, entities, topics, and features) identified in the analyzed corpus.